WhatsApp Calling Problems. Call issues with WhatsApp Calling: Yesterday it was finally there. 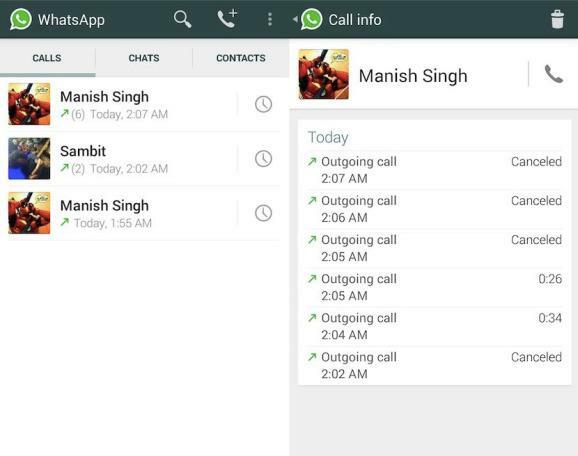 Calling via WhatsApp was activated for Android users. They must install the latest version of the app on their devices. You do not need to update the app if you already have it installed on your phone. The call icon is automatically assigned to the WhatsApp interface. The call function in the chat app has tested for a long time. The calling proces goes through VoIP, the Internet connection of the smartphone. The call quality is generally good with a 3G and 4G connection, but a wifi connection delivers at this moment the best quality. The call function is said to be also ready for iPhone users in a few weeks. It is still unclear when the WhatsApp function will also be launched for Windows Phone and Blackberry users. Problems calling via WhatsApp Immediately after releasing this new function in the app there are a number of major problems arising regarding the call function of the App. In this post we will discuss the most common problems and give you some small suggestions to solve these issues. Nothing is more annoying than when you finally can call via WhatsApp, the other one can’t hear you. Sometime they doesn’t receive a call notification at all. We are also curious about your experience around WhatsApp calling. For this we have launched a special support page. WhatsApp call bundle: hours of free calls? However, the cost of the data usage when u call via internet is not comparable wit the expensive call minutes that count providers at this time. After some testing, we can conclude that our calls via WhatsApp takes an average of 250 KB per minute. That means you have 4 minutes of airtime and talk time for 1 MB. With a subscription of 250 MB, you can call with these data statistics an average of about 1,000 minutes. Surely that is a good 16 hours! These huge numbers of calling minutes are completely free for you. Especially when you consider that WhatsApp has millions of active users worldwide, this means that your ‘normal’ calling plan can soon be revised downwards. Providers worldwide will notice this developments in their turnover reports. [box type=”warning” align=”aligncenter” class=”” width=””]Problem calling WhatsApp iPhone We get lots of questions about problems regarding calling for iPhone users these days. It is currently not possible for IOS devices to call. Also Android users who call iPhones would not be able to start a conversation with these IOS users. The phone will ring but the user can’t take it. Only IOS beta testers have the ability to answer the call. About WhatsApp calling for iPhone we already wrote a blog yesterday. Let us now discuss some WhatsApp telephone problems which came to our editorial staff yesterday. There is massively responded to our call to share your experiences with us. Below, we therefore have combined a number of common problems for you. Do you not you suffer calling troubles? Continue than reading our first experiences around the cost of calls via WhatsApp. [box type=”info” align=”” class=”” width=””]The WhatsApp call icon button is not visible in the app A common problem is that the call icon is not visible in the app. The last weeks this could be resolved through calling someone who already had access to the icon. Now you can easily solve this problem by restarting your phone. Sometimes it may also work by reinstalling the application or update it. This varies for each version of Android. [box type=”info” align=”” class=”” width=””]You hear yourself twice while calling A second problem that occurs a lot if we believe our users, is that they heard the other person double. Sometime they also hear themselves twice. It is important then to restart your phone so that your phone can connect to the Internet again. Often this kind of problems happen because of an unstable data connection. If you test you phone calls via the normal network, and it give also these problems, it may be that the speaker or microphone of your smartphone is broken. [box type=”info” align=”” class=”” width=””]The other person can not hear you and/or you can not hear the other A big problem is when the other can not hear you, or you do not hear the other one. Sometimes a little fault on the line is not bad, but when someone totally not understand you it is obviously an useless function. It is important that your check a couple of things. While you are calling you should increase the volume by pressing the volume button. This way you can influence the not only the media volume but also the call volume. Also the person you are calling need to check this on his phone. Secondly, you should check if this problem occurs on both the WiFi network and 3G/4G network. There are signs that this (3G/4G network) problem is known by WhatsApp, and that they are going to address this problem in their next release. We wish you much pleasure with using the call function. There will always be some things that could be better, but for now we as technically oriented journalists are very excited about the function. It saves us a lot of money. The problems that we described above are resolved quickly with the future updates. Keep an eye on our WhatsApp update page closely. There, you read the latest update news. When a new update of the application is available, we provide you with the download links. Success with these new telephone conversations!